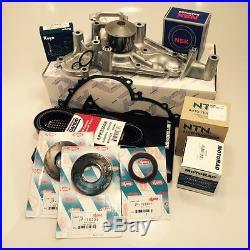 Lexus GX470 Timing Belt Kit. Premium 13 piece timing kit. Everything you need to properly service your GX470 timing belt. Includes only select matched parts from Japanese OE/OEM manufacturers. These are the same parts used and trusted by Lexus, Toyota and Technicians world-wide. Perfect OEM Fit, Quality and Durability. Meets or exceeds Lexus original equipment specifications. All Models with 4.7 Liter / V8 / 2UZFE. Includes The Following Brand New Parts. - - - - -. Please include your VIN and we will confirm fitment. More GX470 Timing Belt Kits Available.. Includes: Timing Belt, Idler Roller, Tensioner Roller, Front Crankshaft Seal, Front Camshaft Seals, Water Pump, Water Pump Gaskets, Thermostat, Serpentine Drive Belt & Hydraulic Tensioner. Includes: Timing Belt, Idler Roller, Tensioner Roller, Front Crankshaft Seal, Front Camshaft Seals, Water Pump, Water Pump Gaskets, Thermostat, Serpentine Drive Belt & Hydraulic Tensioner (No Hydraulic Tensioner). Includes: Timing Belt, Idler Roller, Tensioner Roller, Front Crankshaft Seal, Front Camshaft Seals, Water Pump, Water Pump Gaskets, Thermostat, Serpentine Drive Belt & Hydraulic Tensioner (No Hydraulic Tensioner & Drive Belt). The item "Lexus GX470 13 PC Timing Belt+Water Pump Kit 2003-2004" is in sale since Monday, August 16, 2010. This item is in the category "eBay Motors\Parts & Accessories\Car & Truck Parts\Engines & Components\Timing Components". The seller is "aircabinman" and is located in Laguna Hills, California. This item can be shipped worldwide.